Includes two long tables for setting up the serving of school meals, a crate for the dirty plates, food, plates, milk, trays, serving tools and an outfit for one brother/sister character to wear while serving the food up for his/her friends. 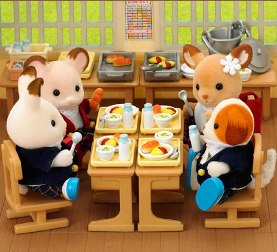 There is enough food and accessories in this set to serve school dinners for six Sylvanians at once. Building, figures and other furniture not included.